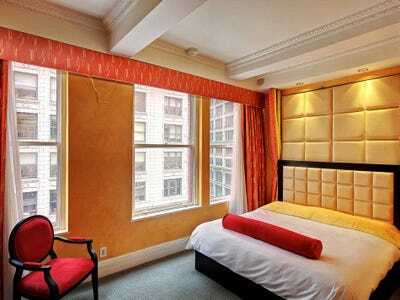 Flatiron Hotel room available for $145 through DayUse Hotels. DayUse, the website that allows you to rent a room for a few hours in a boutique hotel, may soon be partnering with infamous affair site Ashley Madison according to The New York Post.The site, which launched in 2010 in France and emphasises reduced-rate hotel rooms for “work, rest, and rendezvous,” would seem to be a natural partner with Ashley Madison. It has expanded to Belgium, Switzerland, Netherlands, Ireland, Great Britain, Italy, and the U.S., and gained a reputation as a tool for extramarital affairs. The DayUse website says it chooses its boutique hotels for their design, location, and the quality of their services, and currently has 17 New York City hotels among its offerings with the average price set at $100 for three hours. Most of these are close to airports, but a few — such as The MAve NYC, The Sohotel, Blue Moon Hotel, and TriBeCa Blu — are nicer hotels in Manhattan. But with all the recent press surrounding the pay-by-the-hour hotel rooms and the possible Ashley Madison team-up, some hoteliers may soon be putting an end to their relationship with the company. According to The Post, Trust Hospitality, which owns the MAve NYC, will be terminating its contract with DayUse at the end of February. And it may not be the only one given that DayUse marketed itself in the U.S. as a business tool instead of a rendezvous planner, as it did in Europe, according to Reuters. Partnering with Ashley Madison could compromise that marketing technique, and potentially its relationship with U.S. hotels as a result.